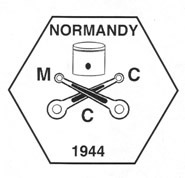 The Normandy Motorcycle Club was formed by locally based Dispatch Riders of E.Coy: Home Guard in 1944. Several months before the Home Guard was stood down, the riders of E.Coy DR's decided to form a motorcycle club, and with that object in mind, they all subscribed a portion of their mileage money that they were paid each month to start off the club. The first meeting was held in October 1944, when it was decided to apply to the Auto Cycle Union for affiliation. When petrol was restored for pleasure motoring, the club held a scramble on W.D. land in Normandy and according to press reports of the day, it was a great success. In the first year of the club, the membership increased from 12 to 56, in which Ces Burgess was elected secretary and within three years, the membership increased to 160 members. 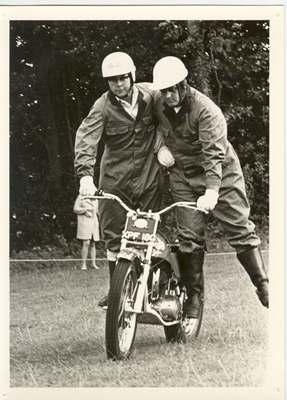 Since those early years the club has organised many Enduros, Scrambles, Trials and many social events and met at various venues in the local area, from the Dolphin Hotel & the Drill Hall in Guildford in those early years. During the sixties & seventies, they met in the scout hut in Normandy, a hall in Wanborough, a social club in Bedford Road Guildford, a farm building near Fairlands, the Duke of Normandy public house, Normandy Village hall and from 2012 Canada House Bisley. Paddy Johnstone, Tom Crowdy, Norman Curtis, George Whapshott, Ted Willmott, Bob Compton, Sid Lucas, Vic Defargo, Eric Crouch, Fred Lewis, Jack Botting and Alf Burbridge. Pictured left to right: Ted Willmott, George Tapp, CW (Paddy) Johnston, Tom Crowdy, Sid Lucas, Norman Curtis, unknown, Fred Lewis, unknown, unknown and Bob Compton. Reg Spicer, unknown, Jimmy Lyons, Ian McCullan, Malcolm Bowyer, Richard Thomas, Barry Oliver, Brian Fowler, Graham Hill, Ray Thomas, Bob Palmer, Derek Webb, unknown, John Woolgar, Martin M Travers and Mark Hancock. Roy Smithers, Tony Warsop (Commentator) and Terry Byard. 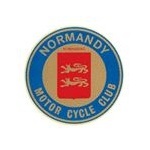 Normandy members showing their skills on riding a motorcycle. Two men on a machine as demonstrated by Graham Hill and Ray Thomas. 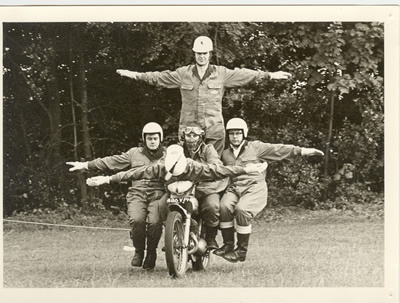 Five men on a motorcycle from left to right, Richard Thomas, John Woolgar (standing), Barry Oliver (at the controls) and Graham Hill, rider leaning forward not known.